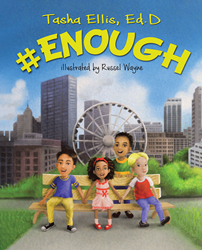 “#Enough” from Christian Faith Publishing author Tasha Ellis, Ed. D is a defining tale of a little boy’s queries into the often-difficult discussion of the moral state of society. Through the wisdom of generations past, the boy comes to realize the importance of conviction and action when addressing issues of racism, bullying, and social injustice. “#Enough”: a heartwarming and sagacious story about a boy’s realizations of a society bathed in imperfection and how this new knowledge inspires him to stand firm and resolute for his convictions. “#Enough” is the creation of published author, Tasha Ellis, Ed. D, a passionate educator, and a recipient of the Teacher of the Year in the Atlanta Public and DeKalb County School systems. Ellis shares, “Christopher’s dad, Lieutenant Chatmon, is Chris’s hero. Christopher’s parents have provided his family with a dreamy life. Christopher has great friends (Kevin and Miguel), is an honor student, has great parents and grandparents, and even a little sister Camille whom he adores (most of the time). Life is great! "Suddenly, a noticeable and unavoidable shift happens. Christopher becomes exposed to brutality through other kids and television. He begins to question why brutal things appear to be happening to children and people that resemble him as opposed to people who look like one of his best friends, Kevin. Published by Christian Faith Publishing, Tasha Ellis, Ed. D’s new book will surely captivate readers in comprehending the positive and negative impacts of technology and current affairs on youth. This book follows the relatable circumstances of an extraordinary boy as he tries to understand the world and encourage positive change despite a long history of social challenges. View a synopsis of “#Enough” on YouTube. Consumers can purchase “#Enough” at traditional brick & mortar bookstores, or online at Amazon.com, Apple iTunes store, or Barnes and Noble. For additional information or inquiries about “#Enough”, contact the Christian Faith Publishing media department at 866-554-0919.